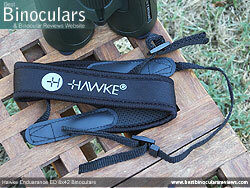 Having already fully tested and been so impressed by the 'outstanding' 8x32 version of the Hawke Endurance ED, I put in a request to Hawke Sport Optics and asked them if they could send me the 8x42 version as I really wanted to see how they would compare and compete in what is the most competitive of all the size and price brackets - That is fill sized, 8x42 mid priced binoculars. Thankfully the friendly folks of Hawke obliged and within a couple of days, I had the green version (it is also available in black) arrive on my desk. Because I have already written about the 8x32 Endurance ED, a fair proportion of this review would repeat what I have already gone over. 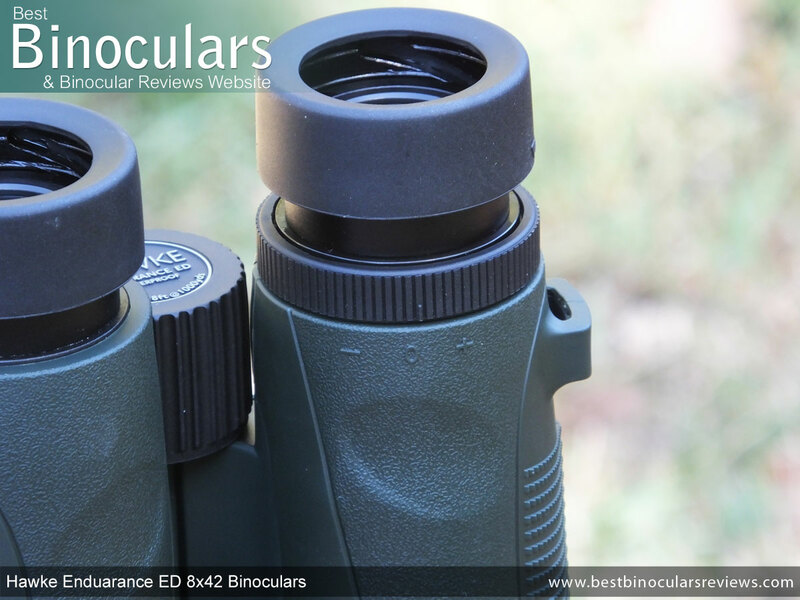 So for this review I will mainly just be highlighting what is unique to this 8x42 configuration and then referring back to the 8x32 review for the parts that are common to both models. I have also decided to test a new format/style of review that I am working on, by adding more video content and less wordy descriptions. Over the years, I have had many people comment and some even complain that my reviews are far too long and detailed for them! So in an attempt to cut down on the amount of reading that I put all you guys through, I have decided to add more videos of me reviewing the bins. 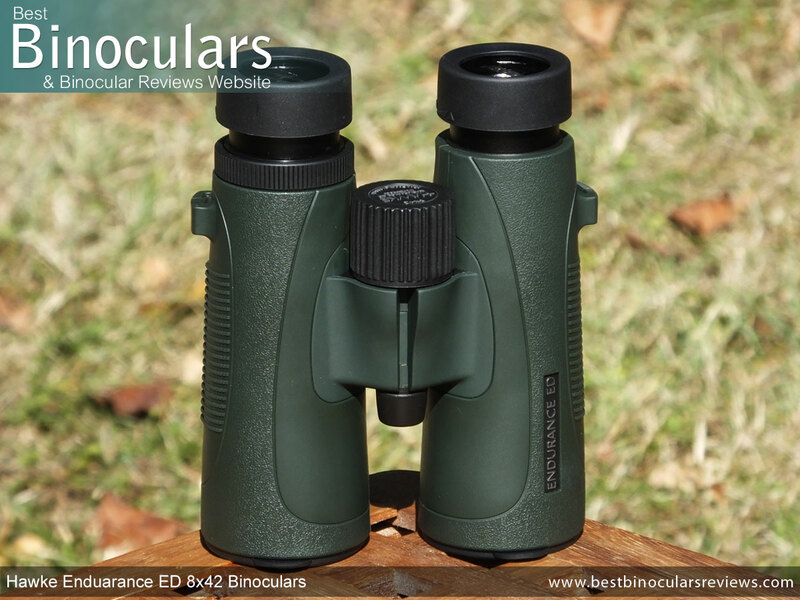 These Hawke Endurance ED 8x42 Binoculars have a thinner bridge than normal that is positioned closer to the eye-pieces than the objective lenses. This leaves more space on the lower parts of the barrels for you to hold onto and is thus more secure where carrying the instrument about one handed. 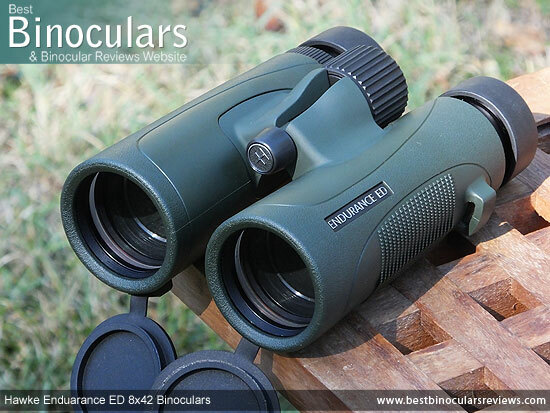 The Hawke Endurance ED is available in two colors, this green version (Code: 36 205), or a black one (Code: 36 204), with the only difference being the color of the rubber coating on the body. Thumb indents on the rear - encourage you to hold the bins at the right point for a perfect balance. 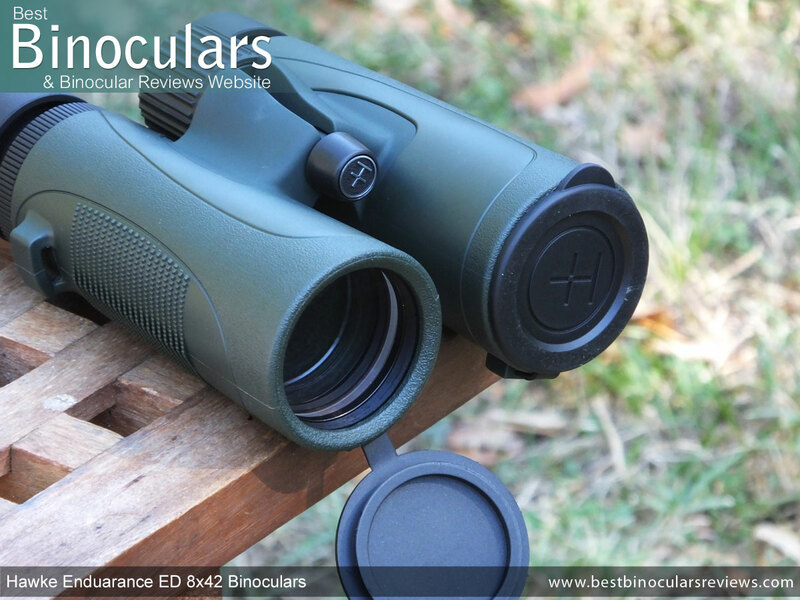 Manufactured out of a Magnesium alloy, the chassis on the Endurance ED matches that of much higher costing bins and many others at this price range will be fashioned out of a polycarbonate plastic, which is more lightweight, but not as durable and nowhere near as classy. The internal's are completely sealed from the outside meaning that these bins are waterproof, however Hawke do not go any further by stipulating to what depth or quantifying it with a internationally recognized standard. However I would say that as long as you don't take them swimming with you, you should be fine! Also keep in mind that a full sealed binocular is not only protected from water, but dust as well which to my mind is at least as important, if not more so. They are also 'Nitrogen Purged' - what this means is the internal air is replaced with dry nitrogen gas. This prevents the internal glass elements from misting or fogging up. During manufacture the air inside the unit is also replaced with nitrogen gas, this dry anti-fogging agent stops the condensation of water on the inner glass surfaces which resemble fog. Almost all good quality bins will have this feature. Whilst not mentioned in their marketing material or product specifications, it looks to me that the eye-piece housings on these Hawke Endurance ED binoculars are metallic and not plastic which many are at this price range are. This is great news as this is the one area on a bino that gets damaged most often when dropped for example. As such it is imperative that these are as sturdy and robust as possible. As they have a rubber coating, it is hard to tell, but to me it also looks as if the eye-cups are metallic as well. Whilst this is not as important as the eye-piece housings, I am sure this contributes to the quality and feel of the twist-up mechanism which is superb on this bin: Smooth, with no looseness or stiff sections. No printed scale is a shame, but not uncommon. Have to make your own mark if you want to remember your setting if it does not happen to line up with the neutral or + or - markings on the bin. 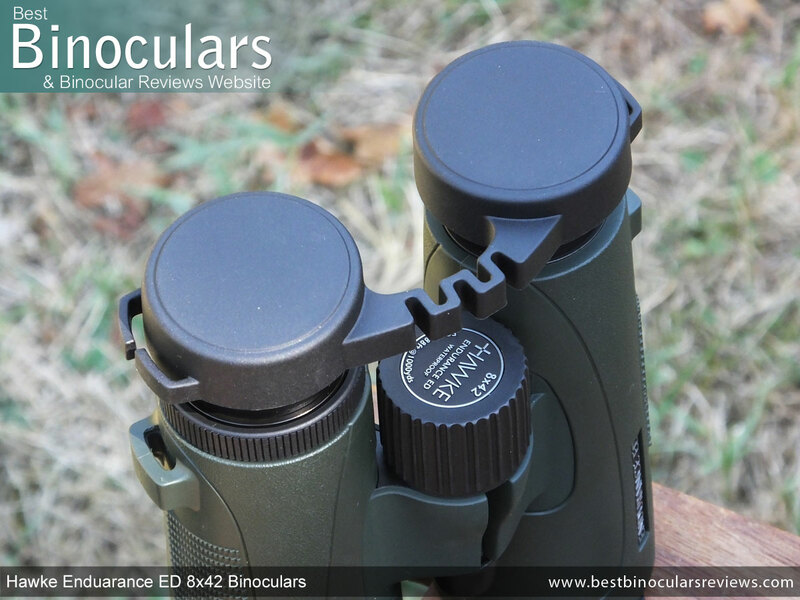 Weighing in at only 652g / 23oz these are one of the most lightweight full sized 42mm binoculars that I have reviewed, impressive in itself, but is made even more so when you consider that they have a magnesium chassis and not a plastic one. To be honest I was a little sceptical and as this would not be the first time that an 'official' specification was proved to be wrong, I decided to measure the weight for myself. Placing them on my digital scale.... 645g and even lighter than published! The official dimensions are listed in the table above - as you can see they compare very favorable versus other instruments in this size class. 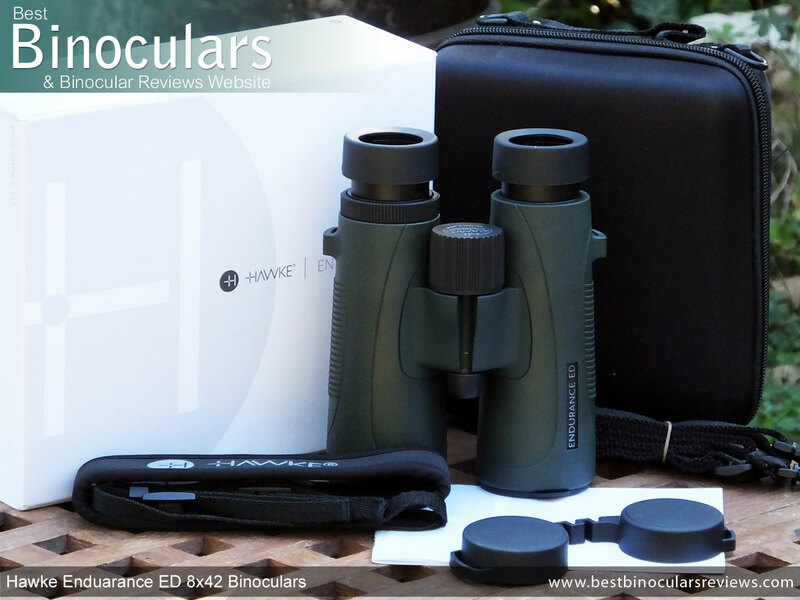 No information supplied as to the exact make-up, but I measured the external ocular lenses on the eye-pieces of these Hawke Endurance 8x42 ED binoculars to have a 21mm diameter, which has to be said is a little smaller than many that I see used on this size of bin. The 42mm diameter objectives are set back inside about 12mm from the ends of the barrels. Which is an aspect that I really like as it provides them with plenty of protection. Be that from physical damage, light rain or even settling dust. As is indicated in their name, the Hawke Endurance 8x42 B ED binoculars have lenses containing ED glass elements. This essentially means that instead of standard low dispersion glass, these have extra-low dispersion elements within the lenses that have the potential to decrease chromatic aberrations even more than normal and thus you may see less color fringing in the image produced. Note: I have purposely used words like 'potentially' and 'may' because just by using ED glass does not guarantee results. The whole optical system has to be taken into account and I have often observed a very well designed non ED glass bin outperform less well designed ED bins. To se how these actually performed in this area (color fringing), take a look at the Image Quality section down below. As the objectives line up with the ocular lenses, it alludes to the fact that these Hawke binoculars use roof prisms to correct the inverted image. Hawke also go on to mention that they are made from BaK-4 glass which at this price is expected, but it always good to know that lower quality glass has not been used. It is always important to ascertain the exact wording used when looking at the level of anti-reflection coatings used. Lesser quality bins will often be marketed as being "multi-coated" or "fully-coated", which can sound like a good thing, but will perform far below bins like these Hawke Endurance ED's that are Fully Multi-Coated. 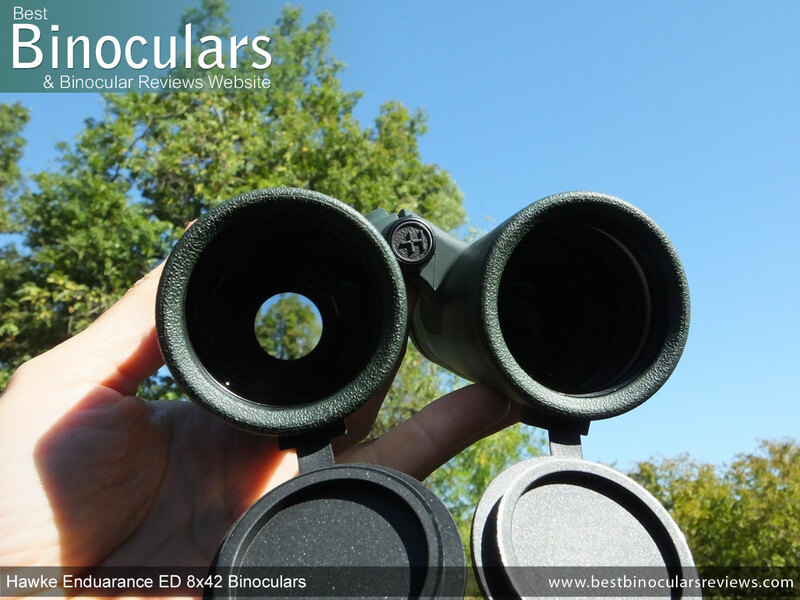 The amount of optical elements and layers of anti-reflection coatings used throughout the optical system of a binocular does make a visible difference to the image quality and brightness. For more check out this section on Anti-Reflection Lens Coatings. I am still awaiting confirmation, but I suspect that the prisms on these are silver coated. Which would be normal at this price level. This is good as this treated surface will reflect up to 98% of the light, but not quite as good dielectrically coated roof prisms that have a reflectivity of over 99%. 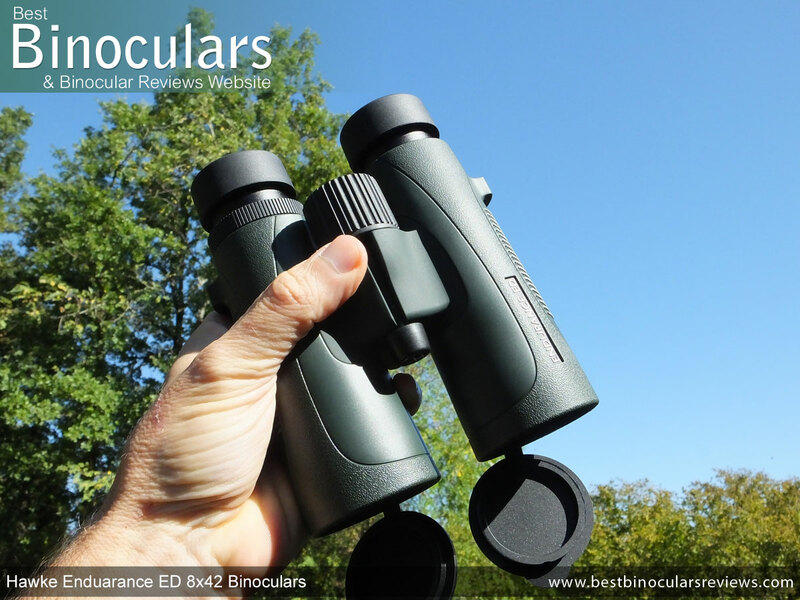 With 18mm of eye-relief and the very good twisting eye-cups, you have plenty of room to manoeuver to ensure that you can view the full image, even whilst wearing glasses. Indeed just like the 8x32 version, these make it onto my list of Long Eye-Relief binoculars. Whilst advertised as being 2m / 6.6ft, I actually measured the close focus of my sample Endurance ED as being only 1.65 meters. 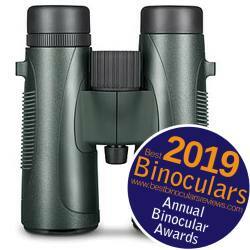 This is excellent for a 8x42 binocular and perfect for those who not only enjoy viewing objects in the distance, but the detailed observation of subjects like butterflies, flowers etc from close range. 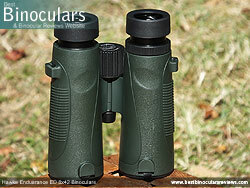 It is interesting to note that all these optical stats are exactly the same as that of the 8x32 Endurance ED. 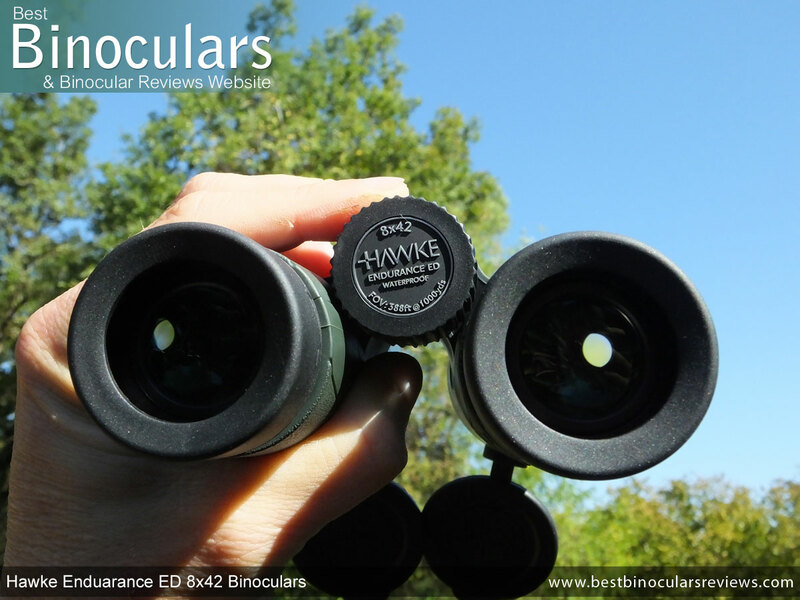 As well as my general observations whilst using them out in the field and when testing, these Hawke 8x42 Endurance ED binoculars were also compared to my mid and high end benchmark 8x42 binoculars on two occasions. Once in good light and again in poor ambient lighting conditions (sunset). 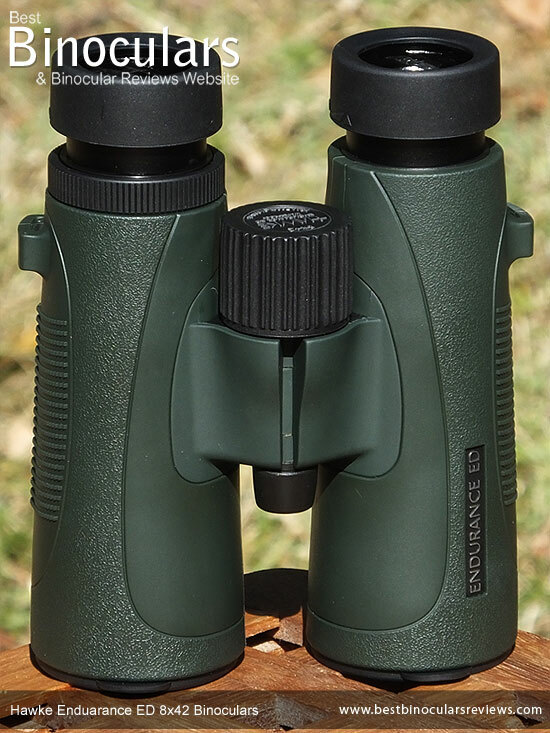 To me, the Hawke Endurance ED bin offers an image that is bright (see below), but still maintains a good level of contrast between dark and light. Thus the image does not appear washed out in any way and you do get a lovely feeling of depth and richness to the view. Likewise I thought that the colors were vivid, but not too much, so as to look unnatural. There also no hint of an artificial tint to the view, which I do occasionally see. 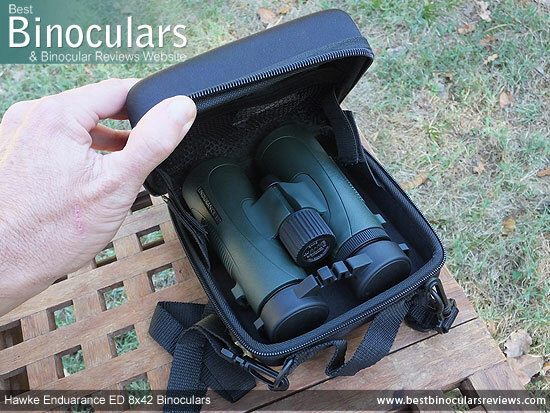 The brightness on all three binoculars to me looked to be equal in good light, which is what I would expect as all three bins have a good level of optics and coatings and in these conditions more than enough light is being supplied to your eyes in order for you to perceive a bright image. In bad light, these looked to me to be as bright as the mid range benchmark and were extremely close to the high end (alpha quality) benchmark. 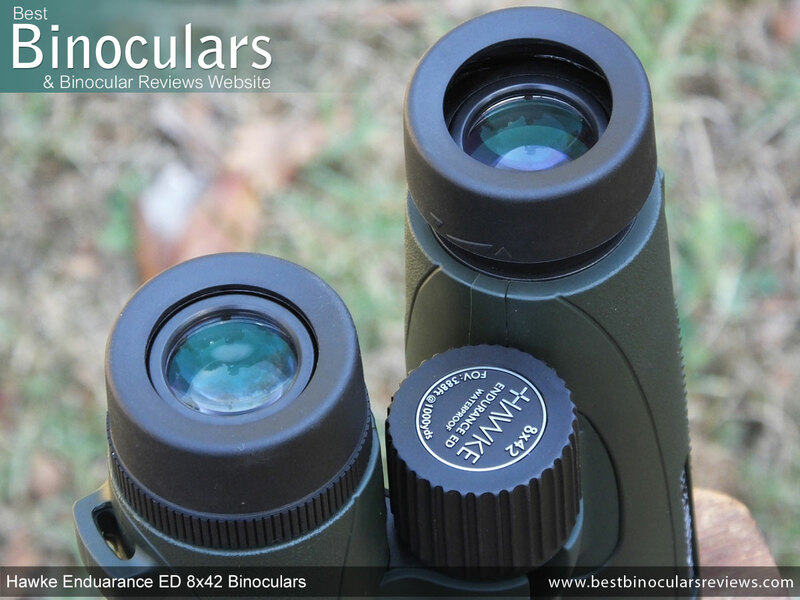 The extra low dispersion (ED) glass used in the lenses is designed to specifically reduce chromatic aberrations that cause color fringing and so you hope to see these perform well in this area... and thankfully they do. 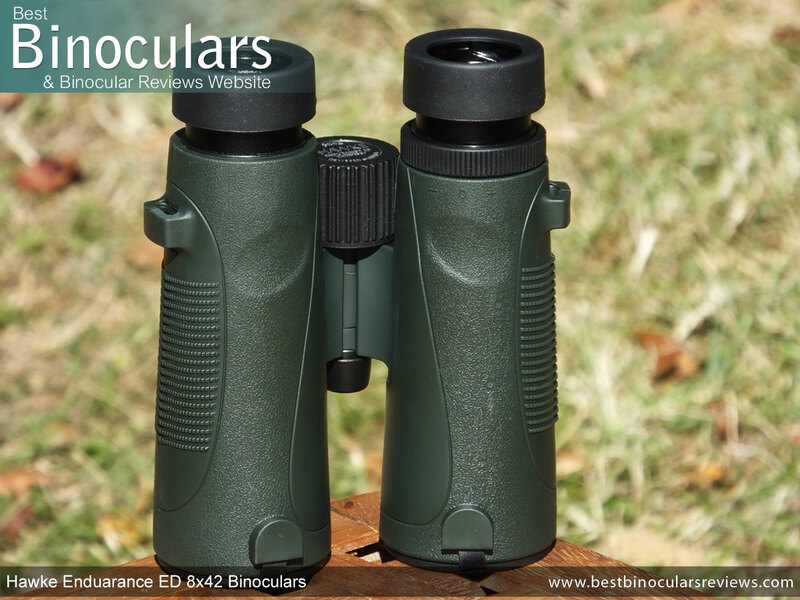 Whilst still evident, it was no worse than that of my mid or even high range bins and most certainly better than that of most lower quality non-ED optics. Blurring at the edge of the view was extremely minimal. Indeed I would go as far as to say this is about as good as it gets in this area, no matter what price you pay. 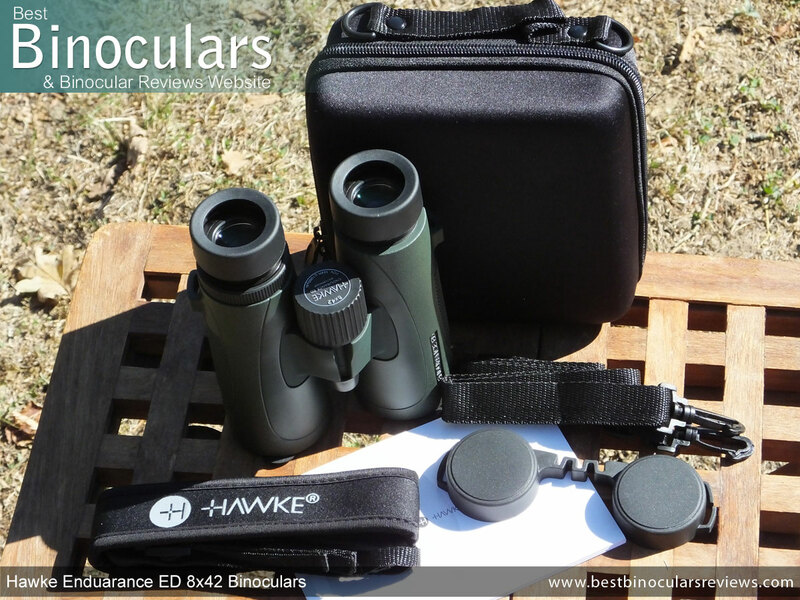 The accessories that come included with these Hawke Endurance ED 8x42 binoculars are exactly the same as those which are supplied with the 32mm version. On the whole these are very good and easily on a par or better than most that this price level. 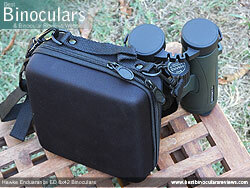 So rather than repeating myself, please take a look at the accessories section on the 8x32 review for all the details. 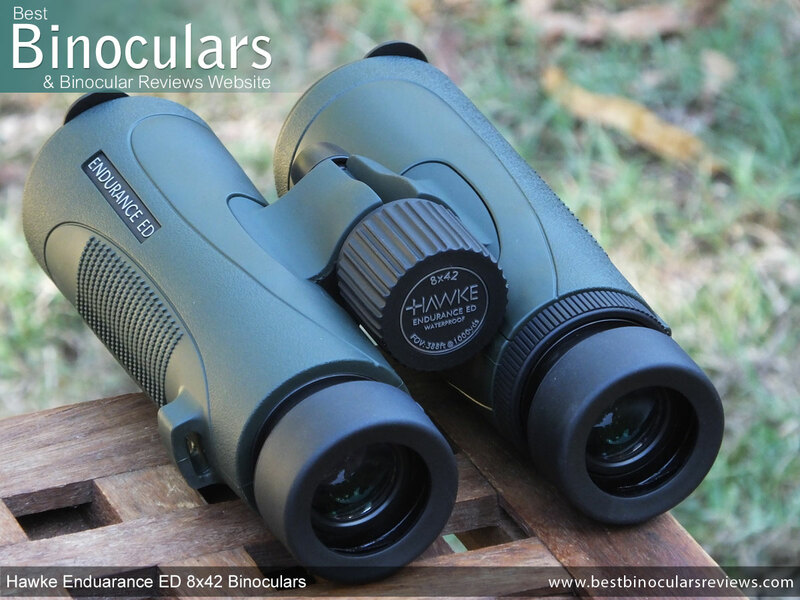 At this price level, I say that the overall build quality, design and materials used on these Hawke Endurance ED 8x42 binoculars is excellent, which in turn and just like the 8x32 version makes them great value within their class and are easily better than what their price tag suggests. 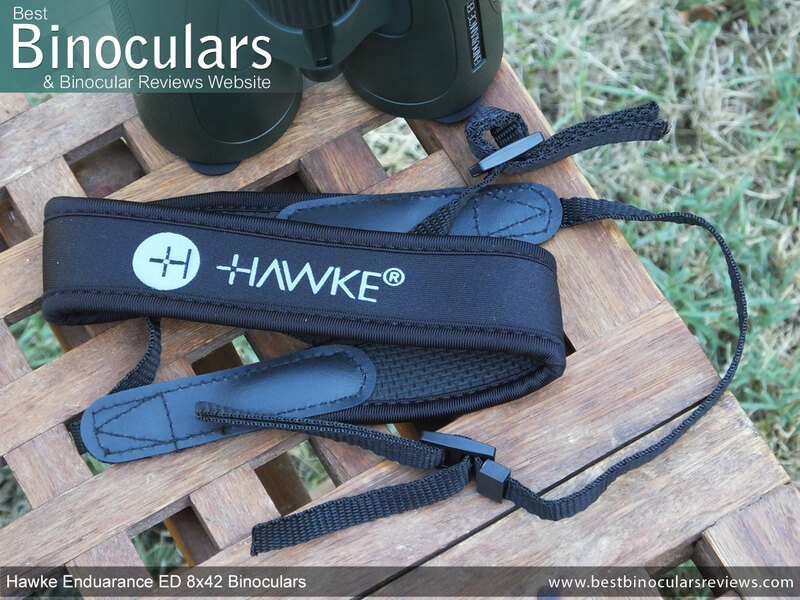 In my eyes, these Hawke Endurance ED binoculars don't have any major weaknesses to speak about which is impressive, however if you had to be picky or if it is a major requirement for your needs, you would wish for a wider field of view. The neck strap; Whilst good and indeed on a par with most others at this price level, does not quite match the level of the included carry case and by this I don't mean the quality. Rather I mean in terms of the minor details, like not being curved or having quick release clips.